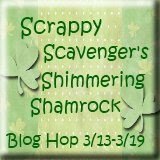 Welcome everyone to the Shimmering Shamrocks Blog Hop hosted by Tanya at Scrappy Scavenger. 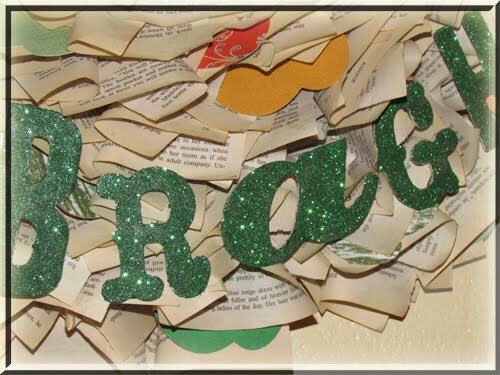 My name is Grace and let me have a few min of your time to show you my shimmering shamrock project, some quick how-to-dos and how to win my Blog Candy giveaway. This blog hop begins at 8 am, March 13th and goes through March 19th. 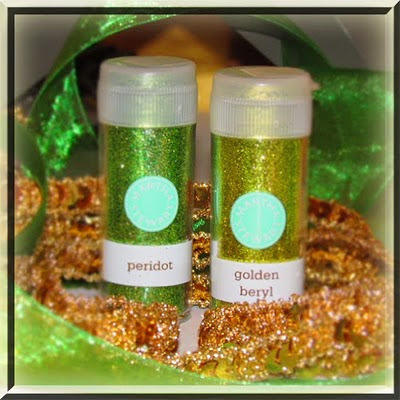 Please gather up your cup of coffee or tea and sit down and relax while we take you through a world of sparkle, bling and of course gold and green. This project is a large wall hanging about 2.5' x 2.5'. It is made from a cardboard base with book pages and patterned paper decorating the clover leaves. I will show you how to make those later in this post for those of you who are interested. 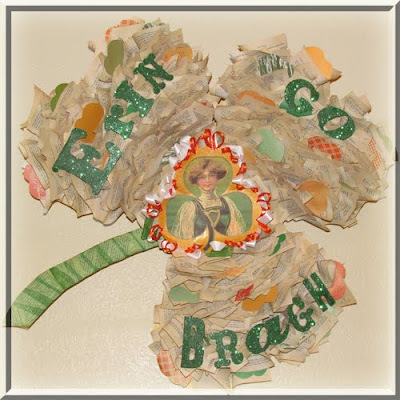 Erin Go Bragh for those of you who don't know is most often translated as "Ireland Forever". Didn't thin you would learn how to say something in Gaelic today did you? These letters are glittered with P K Glitz Glitter... LOVE THEM! The center piece is a traditional Irish lass who is surrounded by the colors of her country. Step 1: Cut the clover shape from a piece of cardboard. Make sure you plan for a spot to punch a hole in to hand it by a ribbon off the backside. You can see the hole I made in the third picture below. Step 2: Find an old book, maybe it is missing it's pages or is worn out and has given it's best to society. It could be a garage sale find or one you have had for ever and never read. Either way make sure it is no one's favorite book. LOL. Before ripping out the pages take your ink pad and run it over all three exposed sides of the book. 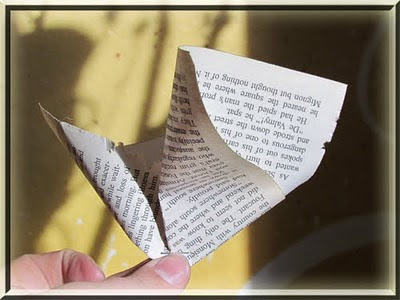 Rip the pages out and gently fold them like this and staple. You can glue this stage but it takes more time. Step 3: Take a few pages and wrap the stem to the clover with them. I used hot glue to attach it to the front then again to the back, cutting off any excess. Step 4: Take your glue and apply it to the area of the staple and glue down to your clover shape. Fill the entire shape with these (mine took about 350 pages). I love the way this looks. Once you are done with this step. Decorate it how you wish. I myself am not Irish but I love it when people have pride in their heritage and their country. So I am giving this project as a gift to one of my friends who's favorite holiday is St. Patrick's Day. In the spirit of giving I have collected a couple of things to give to one random person who leaves a comment on this post (with your email so I can contact you!). To be eligible to win you must also be a follower. So, tell me whats on your mind and make sure you peek around my blog. Follow me and maybe we can inspire each other. Check out the scrumptious blog candy you can win. Two colors of Martha Stewart glitter and three yards of both the ribbon and the gold trim. Encase you get lost or need to make sure you see all the wonderful project made by all these creative projects. Such a pretty wall hanging, I'm sure your friend will love it. Gorgeous wall hanging. Thanks for sharing. I'm a new follower. Grace, such a beautiful wall hanging! Thank you for sharing your work with us! I look forward to seeing more! 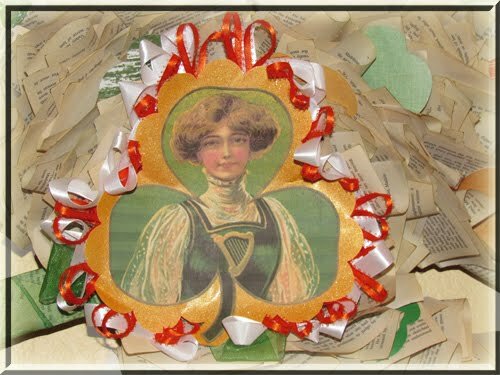 Love your Irish wall decor. The Glitter on the letter looks awesome. This is beautiful------How did you ever figure this out-----I love the whole thing!! !And thanks for being in this hop with us----I am new at this and get so much inspiration for everyone. Beautiful project! 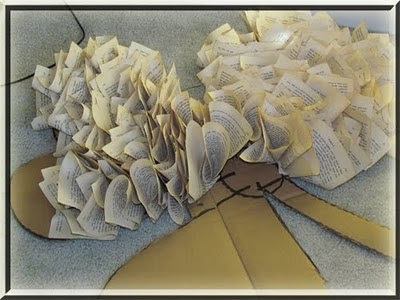 I love the idea of recycling and old book. TFS. I am a new follower. Very interesting project. 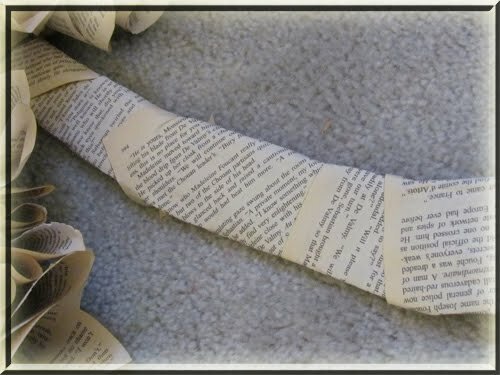 Love the book paper. Wow I’ve never saw anything like this before i would like to give it a try. Wow really cool and interesting. Thanks for the cool hop. Love it! My husband is learning Scot's Gaelic! TFS! Very creative! TFS :) I am a new follower. Thanks for sharing. I like the time you put into your post. Your wall hanging looks great. I like how you used book pages on it.